Fractious goings-on at Churchill Gardens primary in Westminster, where a charity set up by the academies minister, Lord Nash, with his wife, Caroline, has been in discussion with parents, staff and governors about it re-opening as a sponsored academy in September. 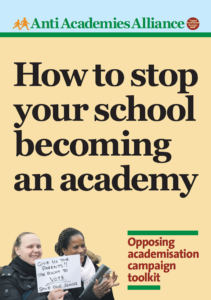 The school for three- to 11-year-olds has faced pressure since autumn 2011 from both the Department for Education and Conservative-controlled Westminster council to become an academy sponsored by the Future chain, following a “requires improvement” Ofsted verdict. But Churchill Gardens’ governing body voted against the plan in December. Future sponsors the neighbouring Pimlico academy, a secondary rated “outstanding” by Ofsted, and will have three local primary schools if Churchill Gardens does transfer. Future has its own curriculum development centre, which focuses on a knowledge-, rather than skills-based, curriculum. Its work is influenced by ED Hirsch, the American academic whose ideas have influenced the national curriculum review. 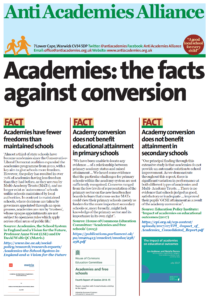 But the governing body’s consultation in November found vociferous opposition among school staff to transferring. Of 45 responding, 35 were opposed, with only two in support. Only 44% of responding parents were in favour. Five out of six governors were opposed, with one “don’t know”. A particular flashpoint seems to have been differing philosophies, with school staff committed to a “play-based” learning approach. Several questioned Future’s expertise in primary education. It recently appointed Annaliese Briggs, a former thinktank director only now receiving teacher training, to head the primary section of Pimlico academy. However, Churchill Gardens’ governing body is now reconsidering its decision, it seems, with one source saying some feel there may be little option but to go ahead. The new school’s governing body would feature Lord and Lady Nash, with Lord Nash chairing and having the casting vote. 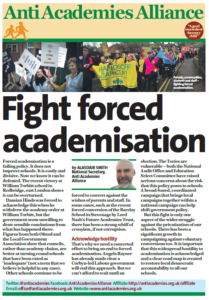 This entry was posted in News and tagged Consultation, Governors, Rejecting Academy. Bookmark the permalink. It really is incredible that since the school has been turned into an academy, the head of Pimlico primary is leaving, as is the head of Churchill Gardens……Oh, and did I mention they are planning on selling the playground now with the children having to play on the roof!